Tune in on 5/30@6:30aET to learn about the latest discoveries in science and technology. 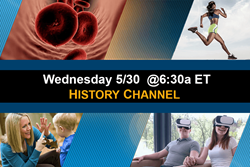 "The Innovations series focuses heavily on science and technology, and the medical community..."
On Wednesday, 5/30 at 6:30aET/PT, on the History Channel, Innovations with Ed Begley, Jr. will discover how science and technology are revolutionizing our world. Check your local listings for more information. This segment of Innovations will educate about a recent research study that is looking at the correlation between chronic stress, micro-inflammation in the brain, and stress-related failures. Focusing on AIBIOS, viewers will see how the study seeks to provide diagnostics to monitor the medical symptoms for preventing worsening of the sickness, which has the potential to lead to therapeutic treatment for diseases with unknown causes. The show will also explore the technology behind Spectiv, a platform that enables users and organizations to stream their unique virtual reality experiences to the world. The Signal Token (SIG) Protocol is designed to decentralize the buying, selling, and rewarding of attention across media platforms by removing centralized intermediaries from advertising transactions. Next, viewers will learn the benefits of American Sign Language (ASL) on the developing brain. In addition to exploring the fascinating history of ASL and ASL research, spectators will also learn about DawnSignPress and their top educational materials, widely known as some of the best ASL and Deaf culture materials available. Innovations will also inform viewers about RawTrition’s all-in-one nutritional supplement. Made from mostly organic whole foods and roots that are free of all genetically modified crops, RawTrition’s BioEnergy helps people get back to feeling healthy, energetic, and clean. Innovations, hosted by award winning actor Ed Begley, Jr., is an information-based series geared toward educating the public on the latest breakthroughs in all areas of society. Featuring practical solutions and important issues facing consumers and professionals alike, Innovations focuses on cutting-edge advancements in everything from health and wellness to global business, renewable energy, and more. Backed by experts in various fields, and a team dedicated to education and advancement, DMG Productions consistently produces commercial-free, educational programming on which both viewers and networks depend. For more information visit: http://www.InnovationsTelevision.com or contact (866) 496-4065.